Preheat the oven to 190°C. Brush Spray & Cook a 20cm-round, loose-bottomed tart tin with some of the butter. Lay over a few sheets of phyllo, slightly overlapping and brush the overhanging phyllo with more butter. Basically what I did here was just line my baking tin with the phyllo pastry sheets, in criss-crossing directions since they are rectangular and the tin is round. I didn't use any butter. I also didn't use as many as 10 sheets (maybe about 6 or 7). Repeat to use up all the pastry. Set aside. Crumble 125g of the feta into a bowl and mix with the rest of the filling ingredients and some seasoning. I advise chopping the spinach to make it easier to combine with the other ingredients. I also recommend being more liberal with the pine nuts and raisins. Now I usually *hate* raisins, but they end up being nice and sweet so get my thumbs up in this dish. 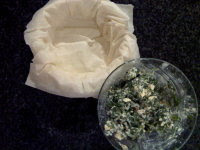 Spoon the filling into the phyllo pastry case and crumble over the remaining feta. 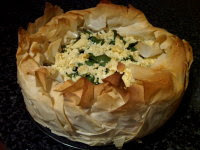 Fold the overhanging filo over the filling and scrunch it up roughly to form an edge. At this point I drizzled my melted butter over the top of the folded pastry rim, which seems to work just fine. Bake for 18 - 20 minutes until golden and crisp and the filling is piping hot. That looks delicious! (I have my reservations about the raisins though). Yum! TSC and I have been doing once-a-week-vegetarian for the past few years and I am always on the lookout for recipes that are quick, delicious and filling enough for him. that looks really yum… I pretty much eat only vegetarian during the week, so this sounds like a great addition. oooh! i totally have to make this sometime. it looks awesome.